“Scientists talk a lot about chaos and they don’t agree exactly on the [mathematical] definition,” Brian Hunt, one of the co-authors, told Gizmodo. So when the journal Chaos asked him and his UMD collaborator, Edward Ott, to write something for its 25th anniversary, he jumped at the chance to to come with a broader definition of chaos — a kind of universal signature, if you will — that would provide a handy mathematical tool for ferreting out where chaos might be hiding in previously unsuspected areas. Alas, most real world systems aren’t that simple — even those that technically qualify as deterministic, like predicting the trajectories of billiard balls after the break. Still, if you could gather enough information, in principle you’d be able to make predictions, especially with the help of a powerful computer. Imagine four shiny Christmas bulbs stacked into a pyramid. If you try to track the light particles (photons) that reflect off those spheres, most will follow clean, predictable trajectories, but every now and then one will get trapped inside the pyramid, bouncing back and forth. That photon’s path is extremely chaotic, but you might not pick up on it using the usual equations. You have to know where to look to find the hidden chaos. This is because there may be hidden variables within the system itself, in addition to the known outside variables affecting how the system evolves. So you can’t just focus on small variations early in the system’s evolution — the essence of the traditional definition of chaos. You also have to monitor those external factors that continue to influence how things evolve over time. The distinction is subtle, but it’s important if you’re trying to better understand, and possibly control, complex chaotic systems. Think detecting hidden pockets of turbulence in the atmosphere (the bane of pilots everywhere), or regulating pacemakers. That’s where Hunt and Ott come in. “Our definition of chaos identifies chaotic behavior even when it lurks in the dark corners of a model,” Hunt said. They found their magic bullet in the concept of entropy, i.e., the reason you can scramble an egg, but can never unscramble it back to its original pristine form. It can also serve as a kind of stand-in for chaos in equations, although the usual mathematical definitions of entropy are so stringent, they’re not particularly useful to apply to real-world systems. 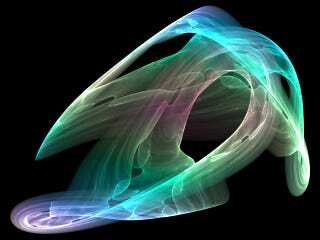 Hunt and Ott proposed a new type of quantity they’ve dubbed “expansion entropy” that is more flexible, and serves as an excellent stand-in for chaos in their broader mathematical definition. It’s exactly the kind of broad-based tool researchers could use to spot a system about to spiral into chaotic unpredictability — like when all hell is about to break loose because your cloned dinosaurs insist on behaving unpredictably. I’m thinking Ian Malcolm would approve. Brian R. Hunt and Edward Ott. (2015) “Defining Chaos,” Chaos: An Interdisciplinary Journal of Nonlinear Science 25: 097618. Edward N. Lorenz. (1963) “Deterministic non-periodic flow,” Journal of the Atmospheric Sciences 20(2): 130-141.